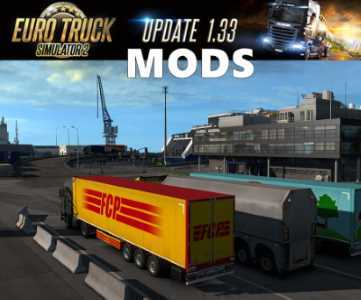 Download ETS2 1.33 mods! We have the best mods that are adapted for this version here: ETS2 patch 1.33 mods. Euro Truck Simulator 2 v 1.33 brings a lot of new updates. As a result a lot of the mods are updated and you have to install them for the corresponding version. Especially given the fact that there are graphics, physics, UI, map, music, trucks and trailers changes. You need to read more about all the updates here: ETS2 patch 1.33: Most important update.